Bullseye 'Online Party' Service - Invite Your Friends! Paul Wright's "60's Sunday Show"
A UK Oldies Station in MP3 Pro! 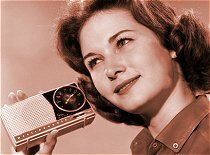 Hits from the 50's and 60's, with clips of radio station air-play like KXOK (St. Louis), WLS (Chicago), KOMA (Oklahoma City), etc. Local Californian Oldies radio - just type in "Kool 104.5 FM"